After the sabbath, as the first day of the week was dawning, Mary Magdalene and the other Mary went to see the tomb. And suddenly there was a great earthquake; for an angel of the Lord, descending from heaven, came and rolled back the stone and sat on it. When I read the Easter story from Matthew for the first time this year, I began to laugh. “The angel of The Lord, descending from heaven, came and rolled back the stone. And then, he sat on it.” He took at seat. Can you see him? This angel in clothing as bright as the first winter’s snow. He rolls up a stone, as if he’s pulling up a chair. I imagine him people watching on a stone park bench or kicking his legs back and forth, like a child sitting in a chair where their feet can’t touch the ground. This spectacular, miraculous, unexplainable thing has just happened! And he casually takes a seat, waiting for those who might have some questions to ask him. Mary Magdalene and the other Mary are there. Unlike the other disciples, fear of their own fate didn’t keep them from going to see the tomb. They went to see the tomb, see the stone rolled in front, the sign that sealed the fate of their dead Lord. Mary and Mary came to see the tomb, to see the signs of death. Instead, the angel invites them to see the place where Jesus used to lay, to see the graveclothes, to see that the marks of death have been removed. When Mary and Mary ran to tell the disciples and bumped into Jesus, like the angel, he said to the women, “Do not be afraid.” “Do not be afraid.” In many ways, these words sum up the whole of the gospel message. Because Jesus has been raised, we do not have to be afraid. It’s doesn’t mean there’s nothing to be afraid of. What is means is that when we experience fear, we do with the empty tomb in front of us, in front of the stone that was rolled away. The powers of death and all of their sidekicks—fear, shame, insecurity, loneliness, guilt, sickness, and self-doubt—Jesus has conquered all of them! God invites us on this Easter Sunday to come and see that the stone has been rolled away. The graveclothes that wrapped Jesus body are stacked neatly where they belong. The seal of death is gone. Where some of us see little hope for a future different than the one in front of us, we see the stone that was rolled away. When the burdens of making it through a single day make us feel overwhelmed and hopeless, we see the stone that was rolled away. At times when others face unemployment and the fear of how to manage, we see the stone that was rolled away. When some of us wonder if our family relationships with ever be what we hope for, we see the stone that was rolled away. In the overwhelming transitions of life from aging parents, changing bodies, growing children and the attitudes that accompany them, we see the stone that was rolled away. When some of us face insecurity in the workplace, impostor syndrome, the shaming lie of the “I’m not good enough,” we see the stone that was rolled away. When we find ourselves asking, how long, oh Lord, we see the stone that was rolled away. If we wonder what’s next with little peace about the future, we see the stone that was rolled away. What about when we can’t see? What happens when we can’t see the stone? When our eyes are blinded by the trappings of death, by the graveclothes wrapped around our faces that keep our eyes from seeing the stone, we help one another strip away the powers of death and all of death’s sidekicks, so that we can all see the stone that was rolled away. This is the foolishness of the gospel! Jesus, our Lord and Savior, was tried as a criminal and died a death reserved for fools, crucified on a cross. But after three days, God showed death who the real fool is, raising Jesus, the one whom death could not conquer. This is the foolishness of the gospel! An angel transforms this seal of death, this tombstone, into a stone pulpit for proclaiming the good news: He is not here! He is Risen! 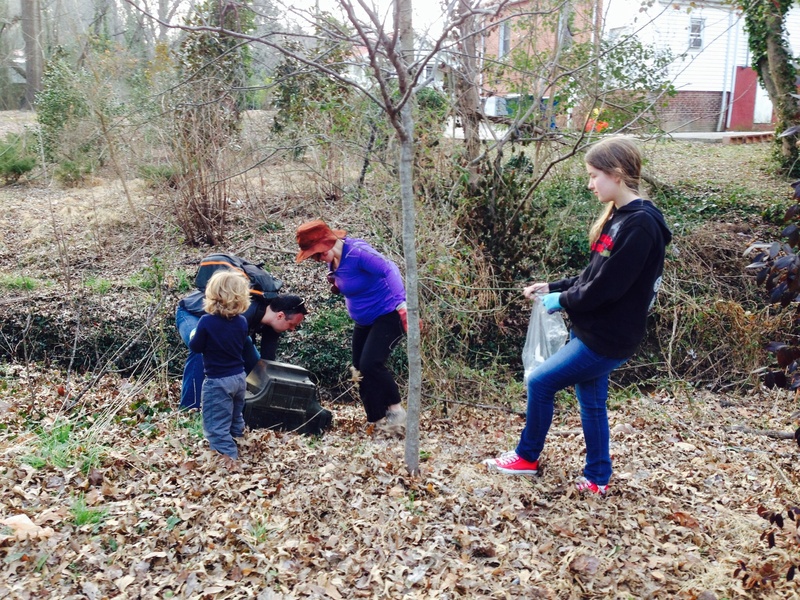 During our month of Community Discernment in January, we took the time to practice remembrance. Looking back over the year, we reflected on what we’ve been up to, what changes we’ve made, and what has been keeping Pastor Megan busy! Looking forward, we pray that God would continue to form us into people that have the eyes, ears, and voices to see, hear, and speak for the oppressed, poor, and marginalized. 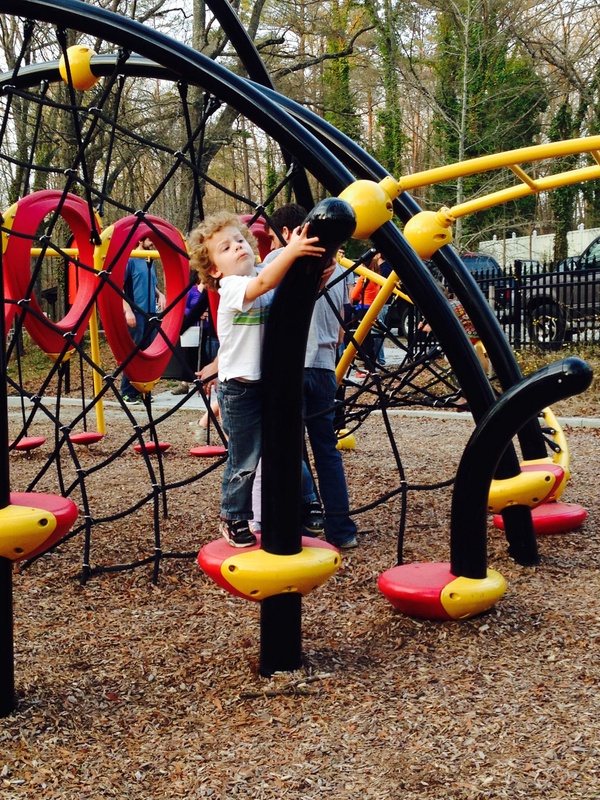 Kid Sunday: Lyon Park Clean Up and Play! 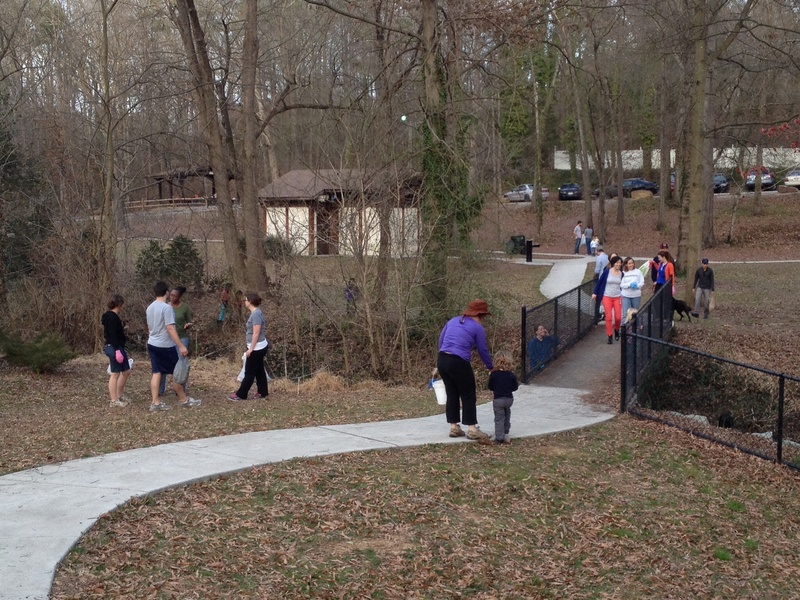 On March 2, we had kid Sunday and cleaned up Lyon Park. It was the final Sunday in the church season of Epiphany. 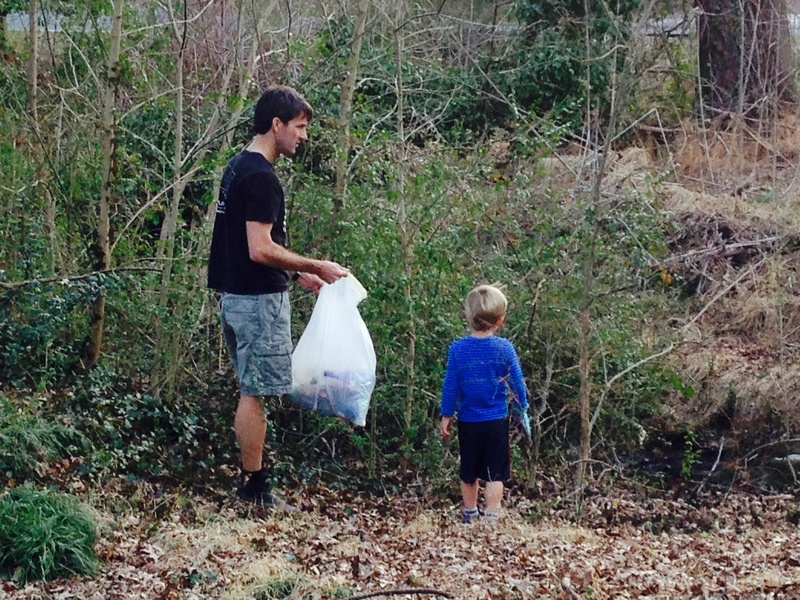 Epiphany means “to show” or “to reveal,” so we participated in revealing who Christ is by showing care for God’s earth and for our community who enjoys this park. During the month of February at Refuge, we read from Paul’s letter to the church in Corinth. homes. (And to think, people think we’re a “non-traditional” church.) Before long, the church grew in number as the Corinthian people shared Christ with their neighbors. In fact, it grew so much, there were enough people to have some differences of opinion. (In church? Never.) Leaders rose up from among these new believers, making it easy for the church to divide themselves up into groups, based on what they believed or how they believed they should live life with Christ. groups, but a people who belong to God. stupid? Will I make any friends? Will I belong?! fan and if you’re not, do you know someone who is? Do you cheer for Duke or UNC? How about Yankees vs Red Socks? Cubs or Whitesox? Celtics or Lakers?! When we cheer for a team, we have a sense of belonging! We are a part of the team, even if we’re only a fan! team; they are part of it. before where you’ve seen those beige colored plastic bags that say “Patient’s belongings.” The bag holds your clothes and anything you had in your pockets when you were admitted. I asked Justin if I could share this story because I heard him say it once and I thought it was so profound. Keith and Justin were talking about what it will be like when Magnolia is grown up. We use this language to talk about people as if they belong or are owned by a particular group or person. What’s even worse than using this language to talk about people in a particular way, is that at times, we treat people or are treated ourselves as if we are someone’s belonging, like an item that they own. The problem is that treating people like a belonging insinuates that one person has the power to determine the worth or value of another person. It gives one person the power to determine the worth or value of another person. People are not cars—you can’t look up their value in the Kelly bluebook. People are not gold—you can’t take one into a pawnshop and find out how much they’re selling for that day. are their belonging. A group of people who began to believe the lies told to them about where and to whom they belong. Lies about belonging. Have these lies been told to us? You don’t belong in church. You belong on the B team. You belong to the United States government. You belong with the 12th man. 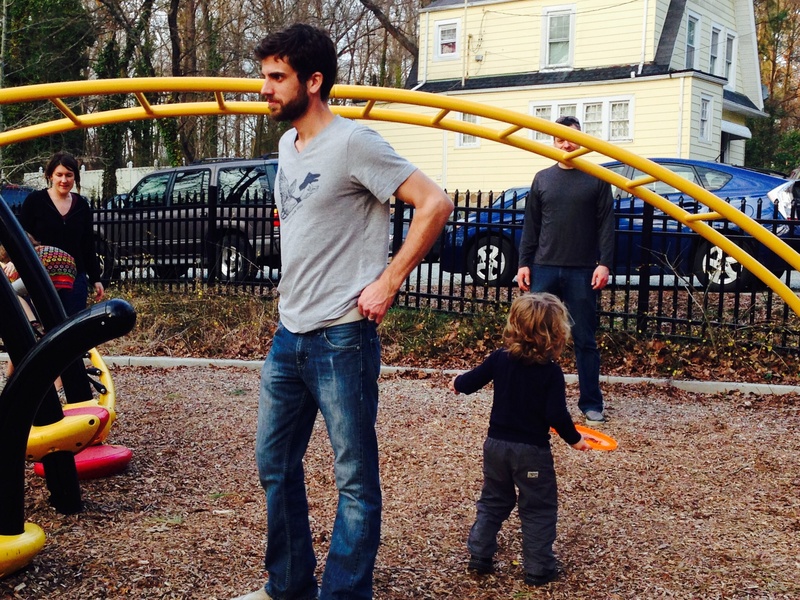 the athletic kids, the kids with two parents, you don’t belong. You don’t belong in a happy family. You belong in this painful relationship. to Christ!” Only God can establish a person’s worth. Only God can say who’s in and who’s out. Jesus, the one whom death could not conquer, from the dead. life together different as people who belong to Christ? One preacher used to say, “Everyone who belongs to Christ belongs to everyone who belongs to Christ.” We belong together, in Christ. We are the given the privilege and challenge that comes with belonging to Christ and one another. So, we get into each other’s business. We don’t have to live this life alone. We share one another’s burdens! We embrace the foolishness of the gospel, befriending someone on the outside. We stop to listen. Since our worth comes from God, we reject petty attempts to secure belonging through our pride or ego or any act that pushes other people to the outside. We affirm God’s worth in others. We refuse to treat other people as objects. We break down dividing walls that attempt to dictate who belongs and who doesn’t belong. We silence the lies the world tells about belonging. In place of the silence, we hear the ringing God’s promise—you belong. This post was adapted from Megan’s sermon on February 23, 2014 at Butner Federal Prison. 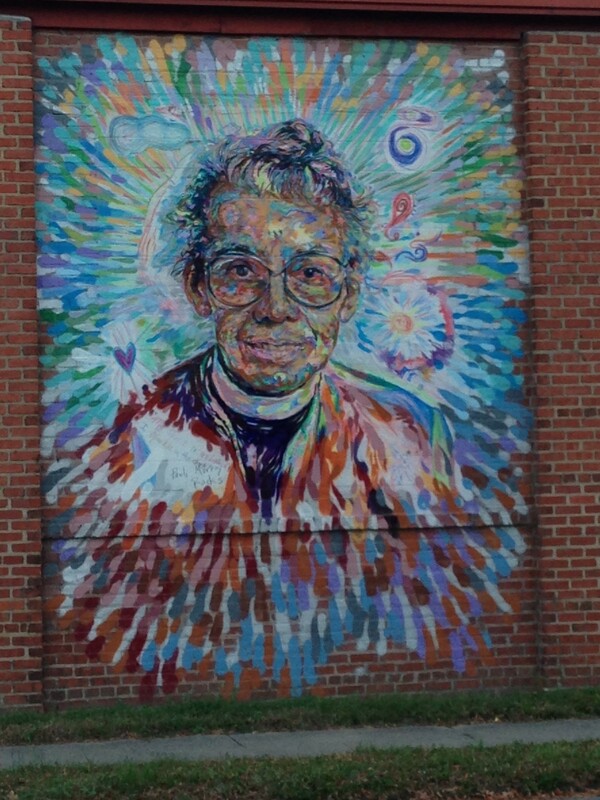 Pauli Murray in the World Mural by Brett Cook. Photo by Kristen Hendrickson. As we celebrate Thanksgiving this week, we are encouraged to pause, take a breath, and remember for whom or what we are thankful. After reading the words of the prophet in Lamentations and the words of Pauli Murray, I would propose that we take the act of giving thanks one step further and practice remembrance or memory this Thanksgiving. Why the sudden change in the poetry, from darkness and despair to hope in the Lord? Though I only included two verses of the lament, the entire first three chapters are filled with complaints, line after line of utter hopelessness. What has caused this change of attitude? What would suggest the possibility of hope? What force can possibly rescue hope from unyielding lament? What would allow the poet the strength to envision an alternative? One word: memory. The poet remembers where they have come from, remembers the stories of their ancestors, remembers other times of great hopelessness, and remembers when God has been faithful in the past. It’s the poet’s memory that allows for the triumphant “but” to break through the wall of lament, allowing a glimmer of hope to enter. Memory, or the practice of remembrance, was a central tenant in the life and writing of Pauli Murray. In her memoir, Proud Shoes, and her autobiography, she engages in the practice of remembrance, telling stories of her family, her experiences, her challenges, and her reflections on her life. She engages her memories and draws upon them for strength, courage, and faith. It seems that memory allows her the freedom to engage with the past in a way that thankfulness might not. When I am prompted to give thanks or be thankful, there seems to be an assumption that I should give thanks for what is good in my life, the things I have, the hand I’ve been dealt, and the relationships in my life that are meaningful. Giving thanks is a good practice. Certainly, the Psalms are full of thanksgiving to God, for who God is and for what God has done. The prophet of Lamentations and Pauli Murray prompt us to engage the next level, beyond thanksgiving, and into remembrance. As the Israelites in exile examined their current reality, they were not filled with thanksgiving. As Pauli Murray recounts the horrific realities of slavery, the oppression and abuse from which her grandmother came, she does not do so thankfully. The practice of remembrance does not necessarily encourage us to remember the good without the bad, in the way that a practice of thanksgiving sometimes does. In remembrance, we find freedom to acknowledge the laments of our past and present. When we remember, we are bolstered with the triumphant “but” of the prophet, that we might discover both thanksgiving for where God has been faithful and hope that God will continue to be faithful. We practiced remembrance at Refuge in November and I would encourage you to take a few moments to do it on your own or with others while you share the meal. What do you remember during this season of Thanksgiving? As you remember where you’ve come from and where you are today, for what or whom are you thankful? 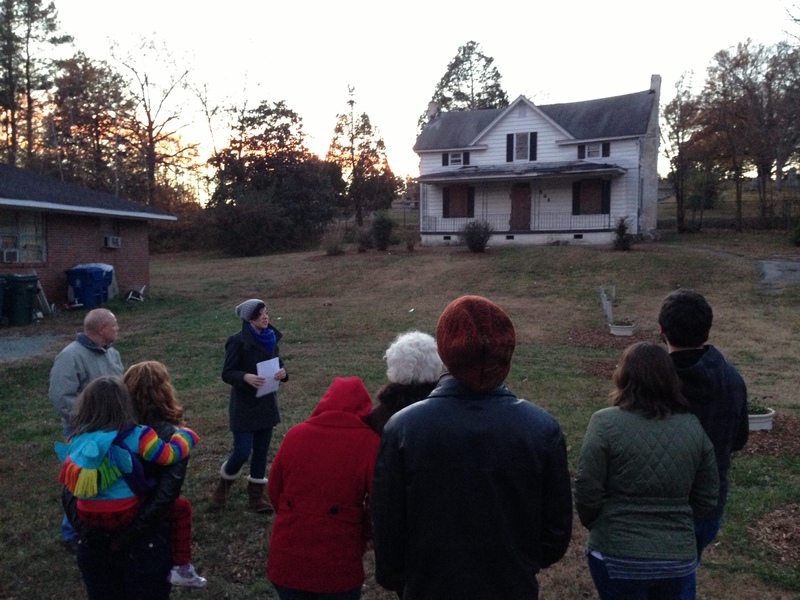 Gathered in front of Pauli Murray’s childhood home on the walking tour with Refuge on November 24. Photo by Kristen Hendrickson. On Sunday night at Refuge, we read from the prophet Habakkuk, a short book tucked into latter part of the Old Testament. If you remember from the Old Testament history we’ve referred to over the last few weeks, Habakkuk likely falls in between the destruction of the two kingdoms, after the Northern Kingdom of Israel is destroyed, but before the Babylonians take the Southern Kingdom of Judah. As we read Habakkuk, we imagine these words of grief and hope spoken as the Babylonians are closing in on the Israelites. They are threatening to destroy Jerusalem, to wipe out their people and land, and to take them back with them as prisoners to Babylon. These words from Habakkuk, then, seem to come at a time of great suffering, imminent doom, and an unknown future. Why do you make me see wrong doing and look at trouble? The wicked surround the righteous– therefore judgment comes forth perverted. I will keep watch to see what he will say to me, and what he will answer concerning my complaint. “O Lord, how long? O Lord, how long?” cries the prophet Habakkuk. How long shall I cry for help and you will not listen? Signs of war are everywhere. He can’t escape. Will it be days before their enemies destroy them? Will it be hours? The wicked prevail! They have taken charge. And justice—what a joke! They have lost. Israel and Judah will be destroyed, wiped out, their house of worship demolished. The prophet complains to God, “I cry and you don’t listen! I plea with you to save us from the violence and you will not save us? and that’s just January-April 2013 in our city. “O Lord, how long? O Lord, how long?” cries a woman behind the closed door of her bathroom. She puts on make-up, but not to make her lashes look longer or her cheeks blushed. This make-up keeps things quiet, makes sure no one asks questions at work, disguises the way her husband treats her in the privacy of their own home, when he makes sure she knows who has the control in the relationship. And what happens? The Lord answers him. This gift from the prophet is a stamp of approval on our own freedom to lament. When we cry out to God in suffering, we actually make a bold statement of faith. Paul picks up on this line from Habakkuk, “the righteous live by faith.” It takes faith, in midst of suffering, to believe that there is a God to whom we can cry, “O Lord, how long?” That plea is addressed, “O Lord?” Even, then, when we doubt God, or wonder if God has heard us, or where God is, when we cry, “O Lord, how long,” we proclaim that there is a God to whom we can cry. Our Lord and Savior made a similar plea in his moment of greatest suffering. Jesus cries from his dying body, “My God, my God, why have you forsaken me?” Honest. Truthful. Accusatory. And faithful. Christ, in uttering these words of lament, anger, sadness, and despair, believes he has a father who will hear his cry. As we lament, we lament not alone, but together. When we plant our feet on the ground, stand at the watch-post, wake each day determined for God to answer when there seems to be silence, we do so together, not alone. We support each other. We listen. We cry together. We speak on behalf of others, “O Lord,” when they can’t utter the words themselves. When we grieve together, being honest with God and one another, we might be surprised that this grief makes room for hope. Hope that wars will end. Hope that we can stop handguns from getting into the hands of teenagers. Hope for those whose bodies are old and worn out that God will answer the promise, “Behold, I make all things new.” Hope for those who suffer in silence, that they might speak and someone will listen. Hope that thy kingdom come, thy will be done, on earth as it is in heaven. The book of Habakkuk closes with beautiful lines of poetry, thanksgiving that God did in fact answer this stubborn, honest prophet. I will rejoice in the LORD. I will rejoice in the God of my deliverance. Laura shared at Refuge on Sunday about theology and art. She argues that doing art can be a spiritual practice or discipline, connecting us to God. The prophets are, in many respects, artists, creating commentary on the world around them as they experience it. This is a video Laura made about art and theology. 1. We are commissioned in scripture to uphold beauty: God is beauty. 2. Develop an aesthetic taste based on scripture, tradition and the Holy Spirit. 3. Then we own a share of the current state of ugliness in our world. Thanks to Laura for sharing her gifts and passion with us and leading us in a night of worship through creating. After our intro to prophets broadly speaking, we began our series on the Prophets of Young and Old in the book of Isaiah. Isaiah is the first book of the prophets and the reading comes from the very first chapter. Chapter one is a kind of introduction (imagine that) to the book of Isaiah, where the prophet puts it all out on the table, holds nothing back. Imagine Isaiah, speaking this sermon, this word from God, in the temple courts. When I was a kid, Perry Mason and Matlock reruns played every weekday from noon to one and from one to two. During the summertime, we would come in from outside, plop our tired, sweaty bodies on uncomfortable wooden stools, and eat lunch with our eyes glued to the 10-inch square white television. I’m not really sure why we watched one or sometimes two hours of dramatic, courtroom TV. As I think back on it, I can’t really figure out what would be so interesting about over-the-top lawyer shows to school age kids. Perhaps the intrigue, the mystery, “the anything can happen” kind of plot. Once you’re in the courtroom…it’s all up in the air. No one knows what the outcome will be. Suspense. Mystery. In the last five minutes, Mr. Mason or Mr. Matlock inevitably conjures up one final piece of evidence that secures the verdict in their direction. Guilty. Not guilty. God’s prosecution of guilty Israel beckons us to also evaluate the sacrifices we make for God. We too are a worshipping community, professing the God of Israel as the one true God. We too make sacrifices for the sake of our faith and the sake of our church. Did you spend years waking up 15 minutes early on Sunday to make sure your clothes were ironed for church? Sacrifice. On Superbowl Sunday, we tevo the game so that we can still meet for church, instead of rescheduling. Sacrifice. Perhaps some of us stood for an hour or two in the rain and humidity to protest the legislature on Moral Monday. Sacrifice. Did you avoid school dances, movie watching and card games until the your church discerned the Spirit’s movement that these things are now reasonable in some instances? Sacrifice. Have you or someone you know taken the time to change your Facebook status once a week to include a verse or a statement of faith and then in the month of November, update it every day so that God knows the things you’re thankful for! Sacrifice! Do you not vocalize all of your thoughts about people you don’t like, but instead keep those thoughts to yourself because of your Christian love? Sacrifice. I paid, or rather, am still paying, for a top theological education at Duke Divinity school. Sacrifice. That money you gave in jubilee last year, could’ve bought you a 50” HD flat screen and put surround sound in your living room. Sacrifice. The question that God asked Israel now comes to us. Are these sacrifices the that God has asked of us? Who made these rules?! What if these sacrifices, like those of the on-trial nation of Israel, totally miss what God has asked of us? What if, like Israel, God says to us, “I loathe your music. Your sermons…they disgust me. Your communion bread stinks. I hate your worship.” Why? Is it because God literally hates what are doing in church, sacrificing our precious time for worship? I don’t think that’s quite it. What breaks God’s heart is when God’s people are more concerned with doing the “right thing” than caring for one another! What breaks God’s heart is when we forget what God has asked of us and instead follow the human guidebook for “right Christian living” or “how to be successful.” The sacrifices we offer to God must not be a list of checked boxes. Did you give away money? Check yes. Did you iron? Check yes. Did you cheat, lie, curse or steal? Check no. What then does God want from Israel…from us? The prophet Micah asks this question directly: “What does the Lord require of you?” Ironed clothes? A long list of things you don’t do? Constant busyness? God offers Israel abundant grace. God offers Israel another way, another chance, another opportunity. God reminds them and us that our worship is marked by so much more than a list of sacrifices, rule following, box checking, and do’s and don’ts. That’s good news because I hate to iron, but I love to dance! Every time we listen to someone that’s on the margins and treat them with dignity, that act is a proclamation that Jesus is Lord. You’re my God! That’s worship! Every time we choose to stand for the least of these, we proclaim Jesus is Lord! When we visit the elderly, write to the sick, shower a child in love and belonging, we proclaim, Jesus is Lord! When we invite people into our homes, to sit at our table, we proclaim, in that act, Jesus is Lord! On September 8, I presented this introduction to the prophets at Refuge. For those that weren’t there or were helping with children, I’ve recorded the same basic introduction. In this video, I recount the story of God and Israel from the Exodus through the post-exilic period. It is an overview, so many details are left out. I draw from Walter Brueggemann’s book, The Prophetic Imagination, throughout the video.